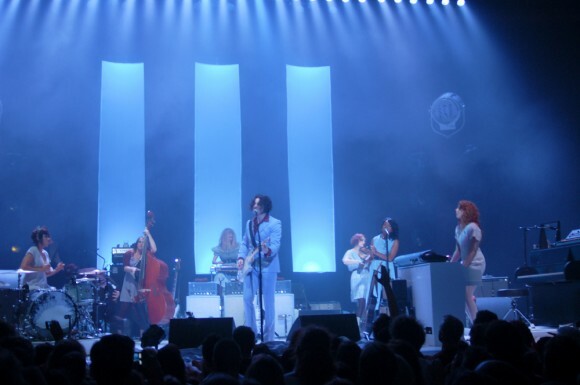 Riding high on the success of his recent solo debut Blunderbuss, Jack White stormed the Wiltern Theatre in Los Angeles, finishing a trio of shows with effortless authority. 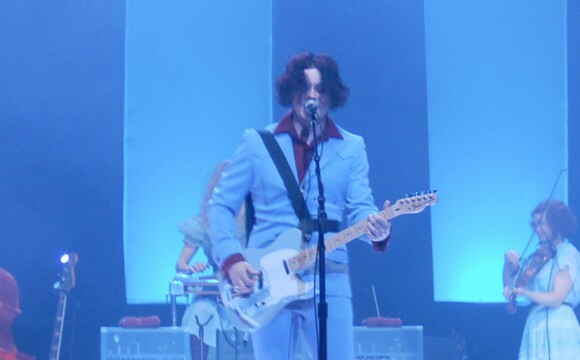 During this first solo tour White has been utilizing two different backing bands, one an all-male band called Los Buzzardos, the other an all-female band called The Peacocks. Reportedly, not even the bands know which of them is playing at any given gig until that day. Tonight, it was The Peacocks turn, and they pack a wallop. 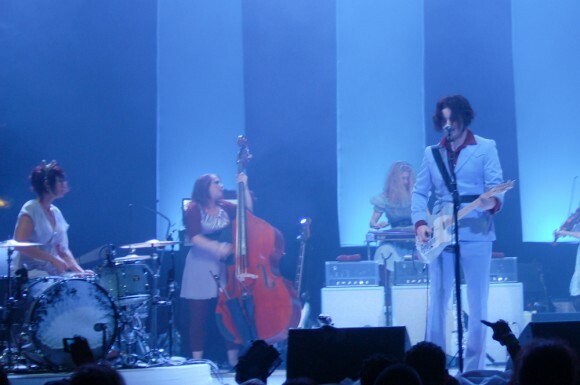 During Blunderbuss track “Hypocritical Kiss” the quality of White’s selections for members of The Peacocks powerfully evident: keyboards were held down with lush nuance by Brooke Waggoner and the supremely talented Maggie Björklund colored up the mix on the pedal steel guitar. And even though “Hypocritical Kiss” is far from the most upbeat song in White’s repertoire, there’s something in his demeanor that indicated an explosive energy. Each chord he hammers out, each verse he sings has a determined sense of purpose. A slower number such as this somehow feels oddly more climactic. The claws really came out on the next song. The largely forgotten “I’m Slowly Turning Into You” from The White Stripes’ Icky Thump evolved into a primal piece of cathartic power. 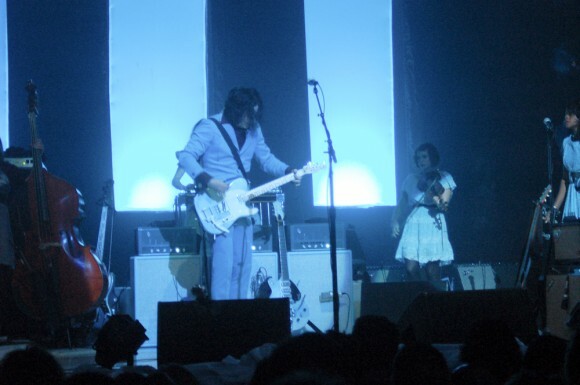 At this incendiary point in the show, White shifted to acoustic guitar for a touch of the spooky (ROME track “Two Against One”) and the soulful (“On and On and On”). By now, the audience could visibly be seen dancing, bobbing and banging to White’s every move like the leader of a great feral tribe. The Dead Weather song “Blue Blood Blues” and the ultra-satisfying “Ball and Biscuit” finished out the set proper, the former a loose bit of infectious stomp, the latter an eye-opening piece of indulgent ear candy. The crowd so enamored by this point, went almost even crazier for the next song “Sixteen Saltines.” White’s secret weapon in The Peacocks is Autolux drummer Carla Azar. Splashing her kit with her left hand sideways like a veteran jazz cat, her thunder brought White to her, numerous times so engaged that he knocked over her crash cymbals. White seemed to change chosen songs on the fly to up the tempo with “Black Math,” the Zeppelin-esque full-throttle onslaught from Elephant. 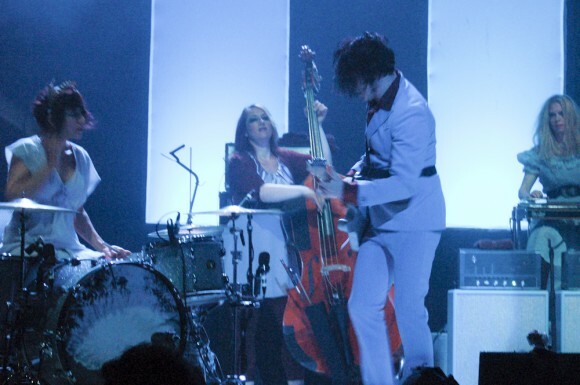 The Raconteurs pivotal track “Steady, As She Goes” started egging the crowd into full participation and the countrified “Take Me With You When You Go” was cemented by Lillie Mae Rische’s serene fiddle playing. 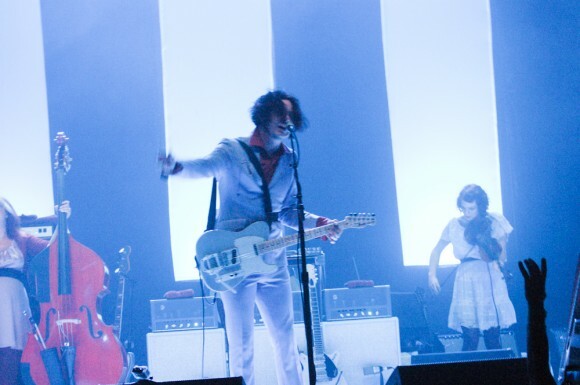 “Seven Nation Army” provided the enrapturing finale to the evening in the set’s penultimate track. At White’s suggestion, the crowd joyously entered into a soccer chant of the song’s primary melody, to which the band played right into. The final number was a softer and pleasant farewell, a loving cover of Huddie Ledbetter’s “Goodnight, Irene,” where Jack serenaded the crowd to the show’s end with the song’s closing refrain, “Irene goodnight / Irene goodnight / Goodnight Irene / Goodnight Irene / I’ll see you in my dreams.” Very pregnant bassist Bryn Davies walked off stage hugging her female band mates with tears in her eyes (White announced during the set this would be her final night with them on this tour before delivering her baby). White on the other hand walked off quickly, waving simply with an almost slant look of nervous determination. 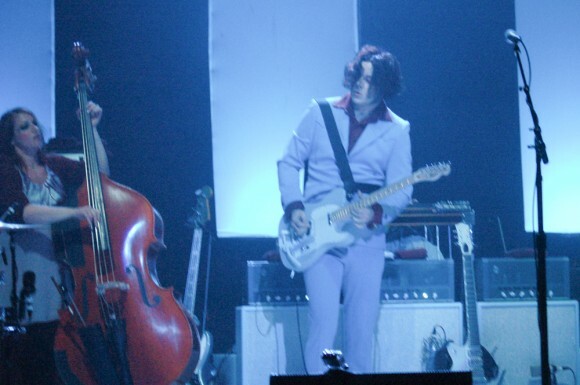 That one glance almost depicts the rare cocktail of elements that make Jack White such an important figure in the last twenty years of music. White has nerve in a way that nearly no one else does, a confident and aggressive energy that plays more like justification than enthusiasm. Whether slow, thoughtful or raucous, each song he plays hints at a veritable ocean of emotional purpose, like White just can’t pour enough power into each song, perhaps even each chord strummed. Somewhere amidst that delicate tapestry lies the primal success in great rock and roll music. Beyond grandstanding and gimmicks, that combination of release, triumph and confidence is exactly what has made rock music beloved for decades unending. It boils the blood, peels away the frustrations of this world and instills energy where it ought to have been in the first place. It turns even a tremulous lamb into a snarling lion, awakening fires deep inside that might have been thought lost or unattainable. White has carved out his place, and hopefully, this is only the beginning.